The 11-02 GMT is an adaptation of the RM 011 case, with the addition of a pusher at 9 o’clock with the ability to set the second time zone function. 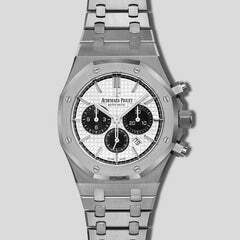 Also, two pushers located at 2 and 5 o’clock control the chronograph start/stop and reset functions. 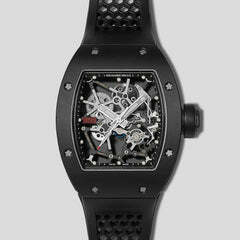 The unique case material used is known as NTPT, a carbon composed of multiple layers of parallel filaments obtained by dividing carbon fibers and then heated and processed by Richard Mille’s own factory in Les Breuleux, Switzerland. The surface pattern displays irregular undulation, with exceptional properties of strength and durability. The Caliber RMAC2 is an automatic movement with hours; minutes; running seconds at 3 o’clock, and oversize date at 12. The flyback chronograph displays the month between 4 and 5 o'clock; central seconds counter and minute countdown timer at 9 o’clock; 24 hours at totalizer at 6 o’clock; UTC function (dual time zone hand with a pusher at 9 o’clock) and adjustable rotor geometry.